We assist IT-professional from all over the world! We’re focused on 100% Veeam customer satisfaction. The Technical Customer Support at Veeam is divided into four offices - Bucharest (Romania), Columbus (USA), Prague (The Czech Republic), St. Petersburg (Russia) and Sydney (Australia). Thus we work with customers around the globe 24/7. How will you assess my CV for Support vacancies? We look at your work experience, skills and qualifications. We’ll also see if you would be a good fit for other open positions at Veeam. Will I be able to work in Support with no work experience? Yes, it is possible to work in Support if you have no experience. We look for those with fluency in foreign languages and strong technical knowledge. Do I have to be fluent in English to work in Support? No, fluency in English is not required. Our department works in many European and American countries, as well as in Australia. We do consider people who are fluent in English, but we also consider those who are perfectly fluent in French, German, Spanish, Italian or Dutch. How should I prepare for an interview for a Support position? We recommend that you do your research about our company and products. You can find a lot of this information at www.veeam.com. If the position you are interested in requires fluency in another language, prepare for the interview in that language. Finally, familiarize yourself with the job requirements. If you are not familiar with any areas listed, make sure to take the time to study them prior to the interview. What kind of people will I provide support to on a daily basis? Our company continues to grow in popularity the global market — we have more than 73,000 users. The users are typically IT specialists at medium and large organizations, and we provide high quality tech support for them. How many people work in Support? We now have more than 1,600 employees around the world, and this number continues to grow. In Russia, we have more than 800 employees, and 90 of those work in Support in Saint Petersburg. We have a floating schedule at the beginning of the day, which you can discuss with your manager. We work for eight hours a day, five days a week and have one hour for lunch. Is there a training period for new hires? We provide training to ensure that employees understand our products quickly and easily. The training period lasts up to seven weeks. During this time, you will learn everything you need to know about the products and how to provide expert technical support. Are there any prospects for professional and career growth? Veeam is still a fast growing company and career development is quite fast and depends on the talents and efforts of the employees. In our department, there are three lines of support. The first line is where people usually start. We fill new vacancies in the second and third lines with the most talented employees from the first and second lines. What is the average age of the staff of the company? 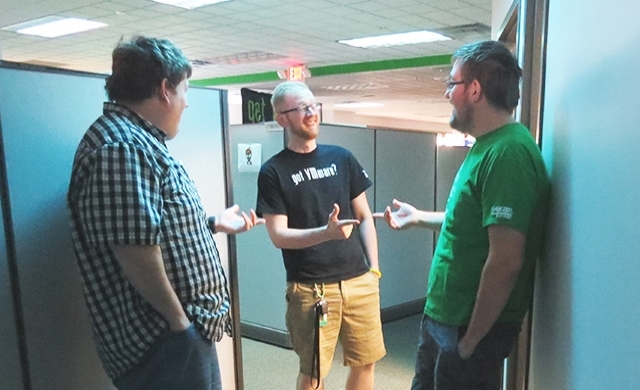 The average age of the Veeam team is 27, and the Support team’s average age is 25. Is it possible to apply to several jobs at once? Yes, we encourage you to browse our vacancies and select the ones that interest you.